Most people tends to believe that ceiling fans are just summer staples; however, ceiling fans are smart additions to the home year-round. It could lower the temp and cool down a space during summer, but during winter you can use counterclockwise to warm the room. Large ceiling fans for high ceilings are a good investment because they can help to save money in power bills in those extreme weather conditions. Finding the best large ceiling fans for high ceilings could be overwhelming: there are so many options! But don’t worry, we have searched thoroughly, considering some variables and have made a nice selection. Keep reading, we’ll teach you how to choose the best large ceiling fans and we’ll suggest you a nice selection among the top-rated ones. After reading, you’ll be able to make an informed choice. 8 Foot ceilings are a challenge, because most residential safety rules recommends to hung leaving at least 7 foot under it. In this case, you’ll need a flush mount or hugger ceiling fan, like this modern 44-in Mazon fan. This gorgeous high ceiling fans has an integrated 18-watt LED module dimmable lights. You’ll be able to use it in any season thanks to it 3-speed reversible AC motor controlled by a remote control. This fan has a diameter of 44 inches, so it could be used in a 225 sq ft room, has an airflow of 2845 CFM and is Energy Star certified. Most opinions says that is easy to install and is pretty powerful and quiet. It’s a great choice for modern and sleek styled rooms. People loves the quiet performance, elegant look and cool breeze. It’s a great option for offices and other quiet environments. Reviews and buyers ratings are essential to build an informed opinion before purchasing something. More stars aren’t the same as best rated, you must look for the product that gets the highest rating with a lot of reviews, as this guarantees that a lot of people has bought this product and is loving it. 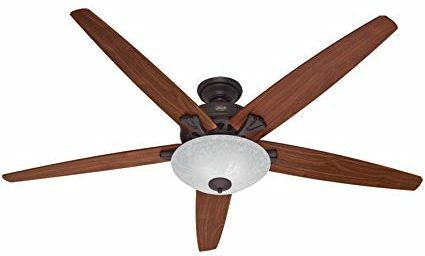 Within this standards, the best rated large ceiling fan for high ceilings in Amazon is the Hunter 53237 Builder Plus. The Hunter 53237 has 52” blades, suitable for large rooms. This sleek and modern looking fan is equipped with a three light fixture with candelabra bulbs. The motor technology makes it quiet, durable, and powerful. With the 3-speed and reversible function, can be used all year-round. Easy installation, has a 3-position mounting system: standard, low and angled. The reasonable price, quality and style makes it the peoples’ favorite. Choosing the best fan for sloped ceilings is easier than anyone can think: almost any fan can be used in a tilted ceiling, as long as is not a flush mounted or hugger ceiling fan. Most high ceiling fans can be used by adapting an standard sloped ceiling adapter, that allows the ceiling fan to be installed on ceilings with pitches ranging from 31 degrees to 45 degrees. This adapter tilts the rod in order to compensate the slope. Most brands has their own adapters, but the most popular ones, like Hunters are easier to find. The best ceiling fan for sloped ceilings could be this Minka-Aire F844-WH paired with this inexpensive adapter. Powered for a 172x 14 mm motor with 3 speeds, this fan has 17W dimmable LED light that can be controlled by a hand held remote. Quiet, easy to install and efficient, the Minka Aire Light Wave joins style and function. 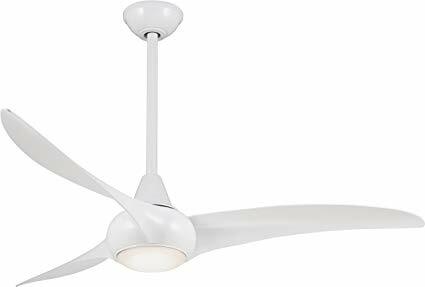 This ceiling fan has a powerful motor that offers a maximum CFM of 5000 and three blades of 52”, suitable for 12 x 12′ rooms. A good large ceiling fans for high ceilings don’t have to cost an arm and a leg. It’s possible to find a powerful, stylish and reasonable priced fan if you look hard enough. In a world where low prices are synonym of low quality, finding the best value can be tricky but don’t worry, we made the hard work for you. If you are looking for a quality fan in a budget the Westinghouse 7802400 Contractor’s Choice is the chosen one. This fan has 52” blades, suitable for big rooms. Its downrod makes it ideal for high ceilings. The silicon steel motor with triple capacitor (and a lifetime warranty) makes an sturdy and powerful fan with an airflow of 4726 CFM and an airflow efficiency of 73 CFM per watt. Perfect for rooms up to 360 sq ft. Pull chain control, 3 speeds and reversible feature, makes it basic and perfect for a person who needs a good downrod ceiling fan with a low price and great quality. Long downrod ceiling fan are the best ceiling fans for vaulted ceilings. The length of that rod must be determined by ceiling height, because the ceiling fan must be mounted 8 feet above the floor (10 foot for steel blade fan) for best performance. For example, if the ceiling is 10 feet in height, and the ceiling fan is 12 inches in height, you will need a 1-foot downrod. 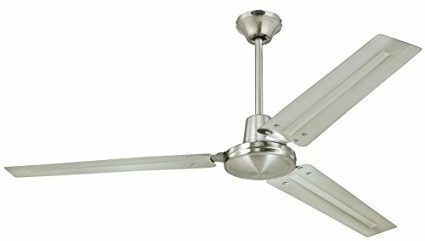 Most downrod mount ceiling fan have a long rod but you could find a longer one. 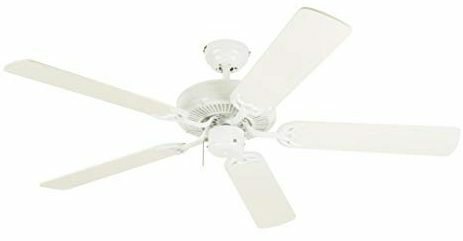 The top rated long downrod ceiling fan is the Westinghouse 7861400 Industrial. Made in steel, this sturdy 56” fan is made to resist. It has a powerful motor that guarantees an efficient air circulation of 7105 CFM and an airflow efficiency of 113 CFM per watt. The Westinghouse has a 5 speed wall control unit. Its warranty is outstanding: 15 year for motor and 2 years for any other part. A huge room with high ceilings needs a ceiling fan powerful and big enough to cover all that space efficiently. Big blades are mandatory in these cases. The Hunter 55042 Stockbridge offers a 70 inch-diameter, 5 reversible plywood blades coated with Hunter’s patented Dust armor, a nanotechnology coat that repels dust. This fan has a sober look and a quiet motor. Made with their exclusive WhisperWind motor, offers an airflow capacity of 7911 CFM. This downrod mount ceiling fan can be controlled by a pull chain, that will let you choose one of its 3 speeds and reverse function. 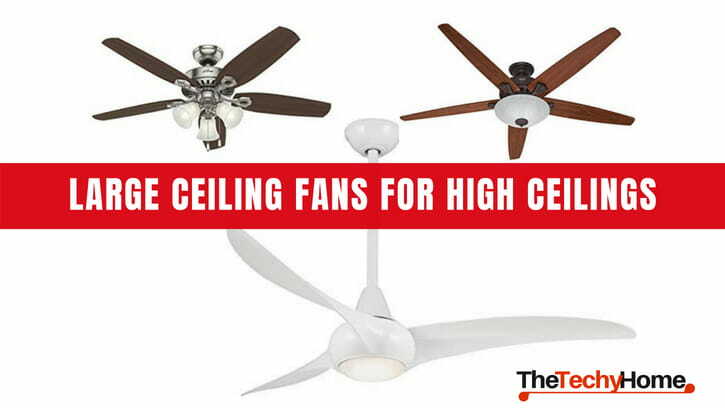 Equipped with a three-light system, you couldn’t find a ceiling fan with this size and quality so reasonably priced. Some buyers says that it’s the best ceiling fans for vaulted ceilings and even installed 24 feet above you’ll be able to feel their power. This is one of the most important points: you’ll need to measure that room twice, because what determines the size of the fan you should buy is the size of the room. You need to know the square footage, because a small ceiling fan can fail to circulate the air properly. Use this guide to help you determine which is the best size, but if you have any doubt, remember that a lil ‘bit bigger is better. The fans have a cooling effect beneath them, but it decreases 2 feet from the blades. Most building codes requires that ceiling fans must be installed at least 7 feet from the floor (10 in case of steel fans). This is pretty important, not only because of safety but for best performance. If the fan is too high, you wont be able to feel the breeze. The best option is to install your fan as lowest as possible. This could seem challenging on a high ceilings, but must ceiling fans includes a long rod that can be adapted in order to make it lower, however, there are cases that ceilings are exceptionally high. Don’t worry, you’ll find a compatible downrod coupler that’ll let you join two rods. Airflow is measured in CFM or cubic feet per minute of airflow. This numbers says the amount of air displaced when is working. However, a high CFM doesn’t mean that a fan is better or more powerful because CFM is not the measure of the wind speed that creates the breeze. CFM is useful to know if that fan is going to be enough to cover the space. The CFM must be from 4000 to 5000 for a good performance, 5000 to 6000 to better performance and over 6000 for the best. Pay attention to wind speed and look for 3.5 or 4 MPH or more. Pay attention to the motor, because this is going to determine the airflow and energy efficiency. Modern large ceiling fans for high ceilings have DC motors or Energy STAR-rated ones. DC Motors are smaller, lighter and are made to generate more torque, and are more energy efficient; while Energy Star-rated can have different construction or system (stack, standard, ball bearing, among others) but regardless of this they must meet a pretty rigorous set of criteria to earn that seal. Read reviews or directly ask for the noise level. Some large ceiling fans can be really noisy and this could be a problem for some places or persons. Mind that DC motors are very quiet, however there’s going to be always some kind of noise created by movement and electricity. If a ceiling fan has a whirling annoying sound it could be fixed by adding some small weight that balances the blades and keep them steady. Fan controls and extra features can add a lot to the final price of large ceiling fans for high ceilings. Basic fans have a pull chain control, but the modern and fancy ones can have a remote control. Most people thinks that more blades are equal to more cool breeze, but this is not true, at least not anymore. Number of blades are more an stylistic choice than a efficiency-related one thanks to new technology and motor types. Ceiling fans have different number of blades in order to appeal to different tastes and decorative styles. There are four popular materials that are widely used to finish ceiling blades: MDF, metal, wood, and plastic. Each material has their own advantages and could affect the final price. Most advantages are related to aesthetic and durability than function. MDF is the least expensive and could look really good but is not suitable for outside. Plastic is inexpensive and admits a lot of stylistic freedom because it can be molded in any shape and can be used in any environment. Wood looks expensive and luxurious, can be carved and styled and are best for indoor applications. Metal blades are popular on large ceiling fans for high ceilings, but must be hung at 10′ or higher. Before buying the perfect large ceiling fans for high ceilings remember that the most important detail is what you really need and want. Think about your dream place: the style, decoration, color and vibe. Now that you have the knowledge, you’ll be able to find a ceiling fan that can be part of that vision that can make you cool and happy.